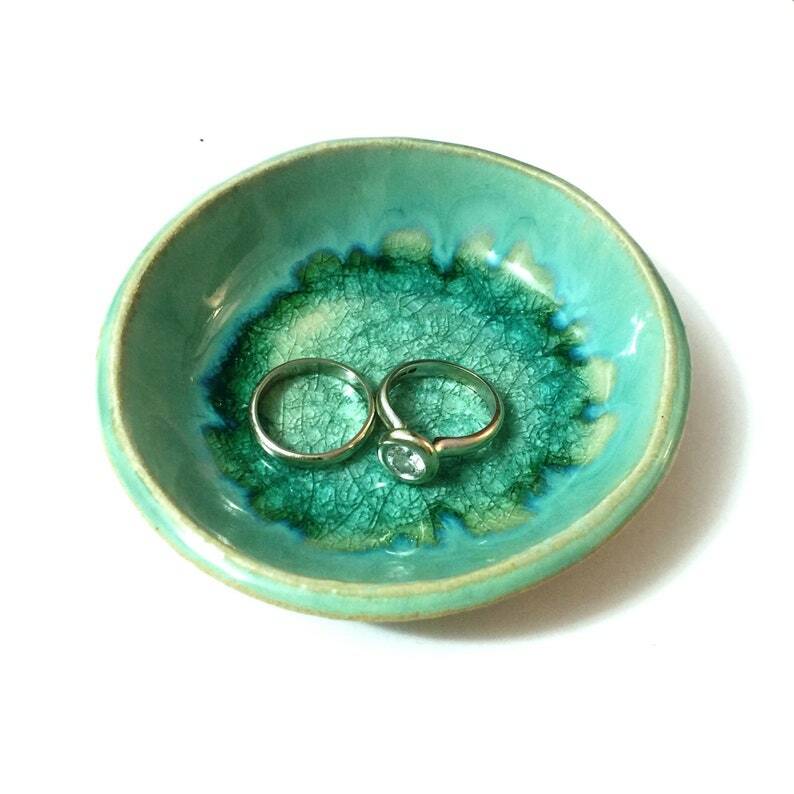 This ring "Mediterranean Sea Dreams" collection holder dish will make a special ring holder to a special ring. Stunning green ring holder. Inspired by nature. Each ceramic dish is hand-built from scratch, cut and shaped by hand from a slab of natural clay. After drying, the dishes go into the kiln for a first fire (Bisque). The next step is glazing (I use only food-safe glazes). The base is left unglazed, so you can see the natural matt color of the clay and enjoy the contrast with the shiny glaze (just like the sea contrasts with the sand and rocks). The second kiln-fire is at a high temperature of 1200°C (stoneware). Size of bowl is about 3.5” in diameter (9 cm) and 0.78 (2 cm) deep. Price is for 1 ring dish. There is a limited quantity of this ring holder design in stock. I can make as many as you need. It takes 3-6 weeks until a made to order Ring holder is ready to ship. Due to the handmade process, each Ring holder is a little different but just as beautiful! Please explore my shop of more designs and colors of same size Ring holder. 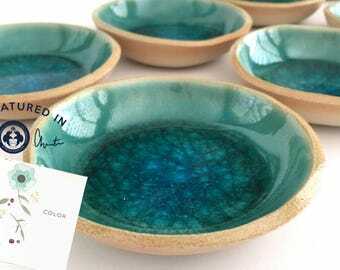 Keep www.VIBceramics.com in mind for handmade gifts for any occasion ♡ . * Estimated duration of standard shipping is 14-26 business days. * Need it faster? See shipping upgrades on check out.